Did you hear it? That gigantic, OCEAN-SIZED sigh of relief that echoed throughout San Clemente on the longest day of the year a few weeks ago? Rumor has it the sigh was heard as far north as Huntington and as far south as La Jolla. The source? Locals know it was the citizens of San Clemente, relishing the stealthy opening of the long awaited BEACHFIRE GRILL, the latest posh restaurant to open in the heart of our Spanish Village by the Sea. This hot new eatery is located at the corner of Del Mar and Ola Vista, right where the Coronet building once sat. Granted, this reporter is too young to have witnessed the Coronet building in its heyday, but the Beachfire Grill makes the spot a sight for sore eyes, to say the least. Anybody that has spent more than 15 minutes in San Clemente and has driven down Avenida Del Mar more than once, has to have wondered what was going to become of that shell of a building once known as the Coronet building. Well, fellow San Clementeans, time to rejoice! BeachFire Grill has accomplished something that a lot of the “jonny come lately” fizzle jobs have missed out on. They have discovered the perfect marriage of exquisite cuisine and a casual atmosphere all on the bend of what should become one of the more happening places here in town. As you walk in, the first thing you’ll want to do is belly up to the attractive bar and marvel at some of the art decor on the walls. Adorned there is memorabilia gathered from various local surf artists, and the bar itself is composed of wood from some of the State Park’s old picnic tables. Their bar menu offers an array of draft beers as well as some tantalizing mixed drinks to take the edge off that lousy Blue Monday. 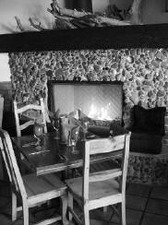 When you’re ready for dinner, your server will seat you at a table found in a warm, comfortable dining area complete with fireplace. Each sumptuous item on the menu makes the diner salivate, bringing to mind several dishes only attempted by the infamous Emeril Lagasse. Caramelized Grilled Halibut and Ginger Peppered Ahi are just two of the enticing entrées offered to those adventurous enough to dine at BeachFire Grill. The Grill is the brainchild of local, Dave Donaldson. An avid surfer, artist and former punk rockmusician, BeachFire is a pure and passionate expression of his love for the beach, killer music and great food. Donaldson’s concept rekindles the beach parties of his youth, infusing his 21 years experience in the hospitality and restaurant industries-including six years as General Manager of the chart house in Dana Point. In his own words, Dave describes BeachFire as, “Transforming the experience of living and dining in San Clemente”. After dining there one can’t help but agree. Live entertainment at the Grill ranges from steel drum bands and calypso, to soft jazz and even the occasional mariachis, plus guest appearances by well-known local musical artists. Lunch, dinner, Sunday brunches and late night schmoozing are all part of the BeachFire experience. Put together the surf videos playing on T.V.s scattered throughout the establishment, the local art showcased on the walls and the exquisite meals, and San Clemente has finally landed a new restaurant to be proud of.